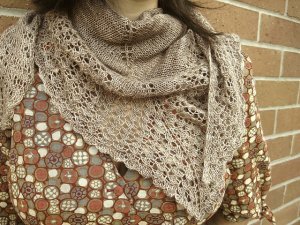 Taken from Grace Akhrem designs: "This stunning shawlette knit in Madelinetosh Prairie is lightweight and perfect for blustery spring days!" This pattern is by Grace Akhrem - Crashing Waves. Size US 6- 32 or 40" circular needles (or size needed to obtain gauge) are required but not included. Finished Measurements: Small- 46.5 X 18.5 & Large- 55.5 X 23" after blocking. Gauge: 18 sts and 36 rows over 4" in St st.
Color Shown is Vintage Frame.